The AFU Global Network led by Dublin City University (DCU) is committed to working to promote and support an inclusive approach to healthy and active aging. Since commencing in 2012 DCU developed Ten Principles of an Age-Friendly University which set out a framework for institutions of higher education to embrace age-friendly practices. In DCU we do this by informing our students and challenging ageism, we focus on innovation to address specific issues affecting older adults, offer learning opportunities for social and cultural interactions, and programmes in education, health, and technology for people across the generations to promote a greater, more connected and productive quality of life to support positive and active ageing. The Ten Principles conceived and launched in DCU clearly resonates with the higher education sector as we currently have 45 members representing 4 continents in the network. On the DCU campus over 2,000 older people attend customised programmes and integrate with traditional students. We have a body of older people who volunteer to inform and contribute to research as citizen researchers and co-designers. We have a large intergenerational programme where students and older people share skills. We also work with those working on behalf of older people as experts in how our AFU Principles are delivered. The impact on students, staff and the wider community has been positive. Ageing stereotyping is being challenged and perceptions have changed. The opportunities to engage socially have brought many older people onto the campus and the evolution of intergenerational organic friendships is very interesting. Lessons we have learned: Involve everyone in the planning, set deadlines, be realistic and review regularly. How collaboration worked: 2010 We established a stakeholder group to look at how our educational institution could work to complement the work of the Age-Friendly Cities Programme. 2012 DCU worked with staff, students, community stakeholders and gerontology to develop Ten Principles of an Age-Friendly University. 2014 DCU employed an Age-Friendly Coordinator to coordinate DCU activities mapped to the Principles. Two universities joined us Arizona State University and Strathclyde University. 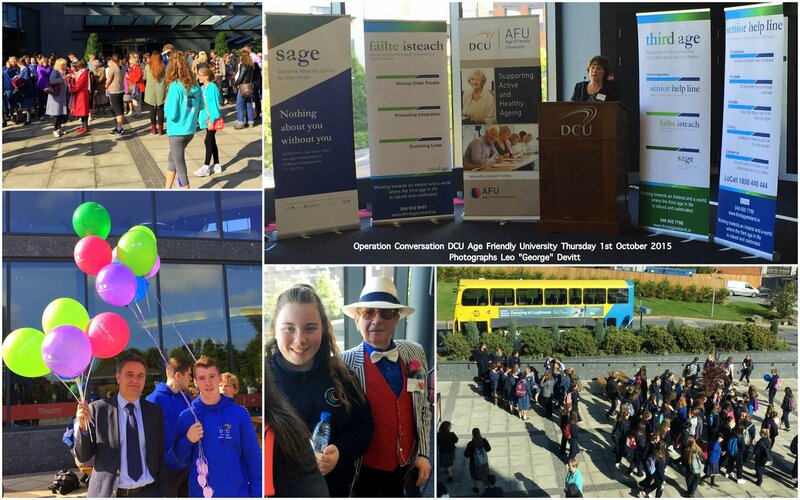 2015 DCU hosted the inaugural international Age Friendly University conference "Engaging Ageing 2015 - Universities as engines of active and healthy ageing" and we continued to develop and expand our campus activities include age-friendly audits and reports on all three campuses. 2017 22 universities had joined and DCU became a member of the AGE Platform Europe, the International Federation on Ageing and was endorsed by the Academy for Gerontology in Higher Education. 2018 DCU hosted 2nd International Engaging Ageing 2018 Conference NEw Frontiers of Ageing - Research, Policy, and Practice. DCU facilitated open access to our undergraduate modules and commenced an internal review of hr policy and practice. A support programme for staff was launched and a specific workshop on caring was initiated. DCU supervised Medical Exercise Programme brings more than 700 older people onto campus weekly. Learning, social and cultural opportunities increase this to 2000. A Taste of DCU - open day for older people brought in over 250 adults for a one-day event. 2019 AFU network has expanded to 45 universities, in DCU over 100 older people taking undergraduate modules, thriving intergenerational computer and music projects, regular meetings with and for older people, a peer lead digital photography group and contributions to H2020 projects on technology, assisted living projects and Erasmus opportunities. DCU will host a visiting group of older people from Berkely in June and a group of Spanish older people in July. The programme in DCU and the development of the AFU Global Network is entirely funded by DCU from our central funds. Details on older people's involvement: The experts in aging are older people. We involve them as much as possible in every aspect of the AFU including planning. Where there is a capacity issue we work with them to build capacity. We could not do this work authentically without their input. Positive feedback daily however we are conscious of using university jargon and often guilty of doing so. We have commissioned an independent evaluation of the AFU Programme in DCU for the Minister for Older People which will be available shortly. Looking back we realize it is a big job to cover. We might have been too ambitious at the start although it is exhilarating it is also frustrating. There is a lot more support needed than envisaged from supporting and capacity building to unifying voices against ageism and stereotyping. It would be better to have several people leading the campaign. If I was starting from scratch I'd have fewer principles and build on them rather than having ten straight off. Getting people to look at the person not their age was challenging. We always seem to be going against the tide - where others look at aging only through the health lens or educational lens we see it is as so much more and change happens slowly we need to accept the small wins, celebrate the big wins and keep on going.